Samosa is my ever time favorite snacks from my childhood. It is in my to do list from long back.Today i had a opportunity to do this. I'm very happy to post this. Make a stiff dough using the whole wheat flour and keep aside for 15 minutes. Heat oil in a pan, add onion and cook till it translucent. Add all the spices and cook till spices get cooked. Divide the dough into equal size balls.Take one roll as like roti and cut it half. Heat oil in pan for deep frying. 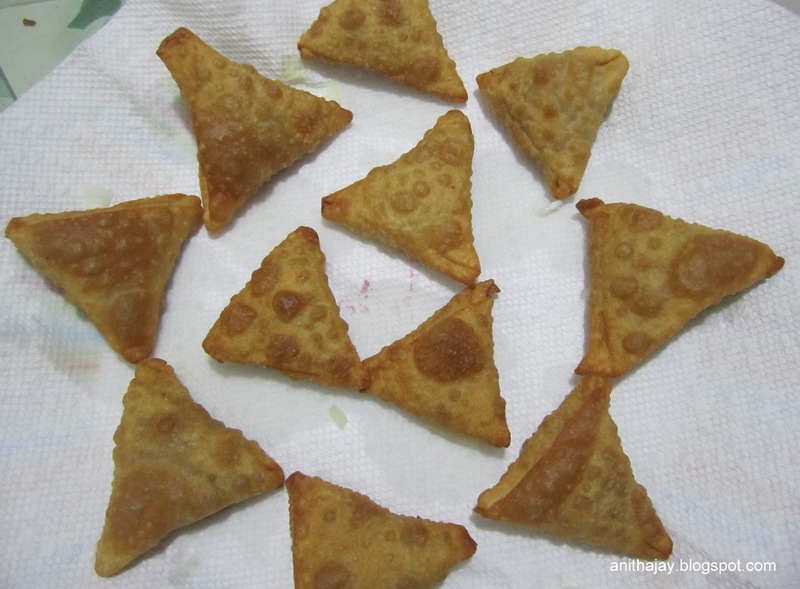 Place the samosas in oil few at a time. After it floating on top turn it to other side and cook till it become golden brown. Take out from the oil and serve hot with Tea or coffee.